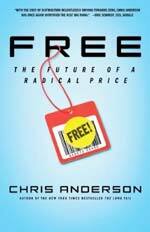 The Virginia Quarterly Review‘s Waldo Jaquith has uncovered several instances of apparent plagiarism within Chris Anderson’s forthcoming book, Free. Unfortunately, I have learned that the VQR‘s investigations only begin to scratch the surface. A cursory plunge into the book’s contents reveals that Anderson has not only cribbed material from Wikipedia and websites (sometimes without accreditation), but that he has a troubling habit of mentioning a book or an author and using this as an excuse to reproduce the content with very few changes — in some cases, nearly verbatim. As the examples below will demonstrate, Anderson’s failure to paraphrase properly is plagiarism, according to the Indiana University Bloomington Writing Tutorial Services’s very helpful website. It is simply not enough for Anderson to cite the source. An honest and ethical author cannot, in good conscience, swipe whole sentences and paragraphs, change a few words, and call it his. Plagiarism is not an either-or proposition, although we leave the readers to decide whether the cat inside the box is dead or alive. It appears that Chris Anderson, who boasts in the acknowledgments about spending a year and a half writing this book, has spent most of these eighteen months repurposing content from other sources. Anderson has explained to the VQR that he had “an inability to find a good citation format for web sources.” But this “explanation” hardly accounts for the wholesale theft of language documented here and at the VQR. And I must point out that, like Mr. Jaquith, I have hardly committed an exhaustive search. In a subsection called “The Three Prices,” Anderson writes about Derek Sivers’s “reversible business models,” but entire paragraphs from Sivers’s “Reversible Business Models” August 2008 blog post have been recycled with very few modifications. Anderson, P. 31: “In one instance, he told his class at MIT’s Sloan School of Business that he would be doing a reading of poetry (Walt Whitman’s Leaves of Grass) but didn’t know what it should cost. He handed out a questionnaire to all the students, half of who were asked if they’d be willing to pay $10 to hear him read, and the other half of whom were asked if they’d be willing to hear him read if he paid them $10. Then he gave them all the same question: What should the price be to hear him read short, medium, and long versions of the poem? Sivers: “Professor Dan Ariely told his class that he would be doing a reading of poetry, but didn’t know what it should cost. He handed out a price survey to all students, but secretly half of the surveys asked if they’d be willing to pay $10 to hear him read, and the other half asked if they’d be willing to hear him read if he paid them $10! When opening Chapter 3 (“The History of Free”), Anderson uses very close phrasing from Charles Seife’s Zero: The Biography of a Dangerous Idea (which Anderson credits). Anderson’s sentences skirt the line between acceptable paraphrasing and plagiarism, but this is certainly a bit too close for comfort. Chris Anderson’s habit of citing a book, without acceptable paraphrase, is also evident in a section on the transistor cadged from Chapter 4 of Kevin Kelly’s New Rules for the New Economy (cited but not acceptably modified). Anderson, P. 79: “For instance, in the early 1960s, Fairchild Semiconductor was selling an early transistor, called the 1211, to the military. Each transistor cost $100 to make. Fairchild wanted to sell the transistor to RCA for use in their new UHF television tuner. At the time RCA was using traditional vacuum tubes, which cost only $1.05 each. UPDATE: In the course of my investigations, I accidentally stumbled upon what was apparently Chris Anderson’s hard drive. The only thing I did was peek at the files related to the book. I certainly didn’t scour through emails or add files, as Anderson suggests. (Indeed, I didn’t even know that this represented a public hard drive.) But Anderson, instead of addressing any of my findings here or at the VQR, has instead accused me of adding files to his hard drive, a charge that is patently false. Because I neither possessed the knowledge nor the desire to mess with Anderson’s hard drive. Anderson has since made his hard drive private, demonstrating just how committed he is to open source. UPDATE 2: Anderson’s spin control continues. Chris Anderson has told the Guardian that the errors were “a lot less” than the VQR suggests. UPDATE 3: Chris Anderson issues a response on his blog, but refuses to address the verbatim excerpts cited above, despite additional requests in the VQR thread. As example, Ariely described an experiment in which he offered to recite Walt Whitman’s Leaves of Grass to a classroom of students. Half the students were asked whether they would pay $2 for the pleasure of hearing him read the poem, while the other half were asked if they were willing to listen if they were paid $2. Then both sets of numbers were asked whether they would attend the recitation if it were free. One can see a major difference between Anderson’s practice of cutting and pasting text from websites and Shell’s actual journalism. Shell actually went out to talk with Ariely. Shell then summarized Ariely’s example and explained to her readers why it’s important within the context of her point — in this case, the framing and the perception of pricing — and developed an independent explanation. Anderson, by contrast, merely used the Ariely example that was also used by Derek Sivers, and even closely parroted Sivers’s phrasing of the Ariely example. UPDATE 5: Boing Boing’s Xeni Jardin offers propaganda in favor of Chris Anderson. Jardin is a frequent contributor to Wired, but she’s failed to disclose this pivotal conflict of interest in her post. Additionally, former Wired regular Mark Frauenfelder can also be found defending his beloved employer. Don’t you just love journalistic integrity? UPDATE 6: It pains me to report that the Los Angeles Times‘s Carolyn Kellogg has written an ostensible “story” on Anderson. Unfortunately, Kellogg has failed to contact anybody other than Anderson and Mark Frauenfelder, who has professional connections with Anderson at Wired (which are not disclosed by Kellogg). With quotes like “My attribution failures aside, this is an important book,” the piece reads like it come from a press release issued by Anderson’s publicist. If Kellogg practiced objective journalism, she would have spoken with Anderson, Waldo Jaquith (who broke the story), and a plagiarism expert — thereby giving the reader an objective account with which to make a decision.